Today when I was surfing over the Internet suddenly my Internet got disconnected and Google Chrome showed an error "This webpage is not available DNS Probe Finished No Internet". I applied all my technical skills but none of them worked. Then I searched over the web but didn't mind much help. So I decided to find all the working solution of this error. After a deep study I've collected around 8 methods to fix this issue. The only reason to present such a big collection of ways is that sometime one methods doesn't work for one a particular person. He or She might be getting this error due to the other reason. 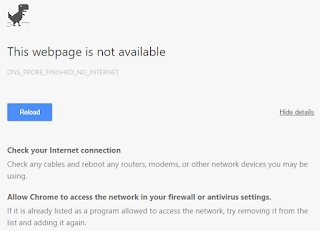 Follow simple steps to fix DNS_PROBE_FINISHED_NO_INTERNET error code in Google Chrome. Most probably this method would work for you. 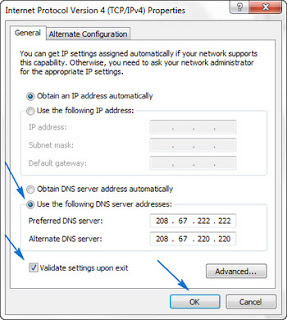 Simply change your DNS setting from automatically to manual and enter values of Preferred DNS server and Alternative DNS server. Simply right-click on your network icon from task bar and open Network and Sharing Center. Then search for Local Area Connection and open it, after that from the new window click on Properties. Then select Internet Protocol Version 4 (TCP/IPv4) and hit Properties again. A new window will pop up simply select the radio button that says Use the following DNS server addresses and enter these values 208.67.222.222 , 208.67.220.220 respectively. Then just click OK and save the settings. You can choose any other DNS addresses too from the Internet. Press Window Key+R to open Run , type cmd and hit enter. Command Prompt will open and now just type below mentioned commands one by one. Now Restart your computer. You're done. Sometime by just clearing cache and restarting browser this bug can be removed. Here I am showing how to remove cache in Google Chrome browser. Navigate To Options (3 Parallel Lines Top Right Side)>> Settings. Now scroll down and click on Show Advanced Settings. Under the privacy option click on Clear browsing data. A new window would pop up, simply clear the cache from there. Similarly you can clear in cache in Mozilla Firefox, Safari and Opera. Open Run (Windows Key+ R) and type devmgmt.msc and hit enter to open Device Manager. Search for Network adapters and expand it. Now right-click on your network adapter and select Update Driver Software. Then you have two choices either allow it to update automatically or select compatible drivers manually. Once you've updated drivers, you'll be able to connect again. There can be some issue in your router. By rebooting or restarting your router you can get back your Internet to work again. Now just find an option to reboot your router device and connect the Internet again, that's it. You probably do not know that websites can contain Viruses, Trojans or any malicious software which can harm your system. So to protect you from these your Windows contain firewall system. Your system's firewall might block any website which look suspicious to it. Open your firewall settings and try to find out whether the particular website you're trying to visit is blocked or not. So this was all about how you can remove dns probe finished no internet error in google chrome. Try any of the above method listed above. I am sure one of them would surely work for you. If you still have any doubt or query then feel free to leave a comment below in the comment section.